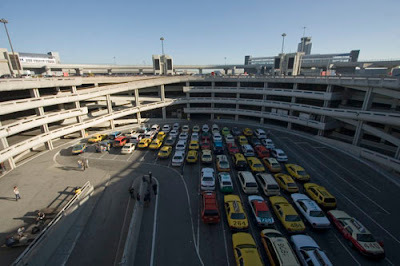 SF Taxi Media: Eliminate the Short Line at the SFO? Airport Officials Likely to Recommend It. Eliminate the Short Line at the SFO? Airport Officials Likely to Recommend It. Airport officials held their 12th and final meeting with taxi driver/industry reps today to present their decision on what they will recommend to the Airport Commission on how to replace the current time based short system. They'll be making this recommendation next Tuesday, Dec. 7 at the Airport Commission Meeting at 9am, City Hall, Room 400. The plan they came up with is along the lines of what we had discussed at the last meeting. There will be a single line, no more short line, except for the CNGs that will continue to get "head of the line privileges" for the life of the cars, then the CNG pass through privilege will be phased out. This is because when the original decision was made for the CNG pass through, most of the cabs were straight gasoline cars and it was meant as an incentive to purchase the cleaner burning CNG. Now almost all SF cabs are alternative fuel vehicles and soon they will all be. We'll be charged $4 each time we go through the airport, but $3 of that will be passed on to the passengers. There'll be a $14 minimum charge from the airport, plus the "airport charge", so the total minimum charge will be $17 (or $4 for the airport, $13 for the driver). The big question is, how fast will the single line move? On other marvelous airport news, Terminal 2 (the old International Terminal) is expected to open in April. At that time they'll move the shuttle buses downstairs to where the Airporter buses go now. We'll have to make sure they keep their soliciting in check. Cameron Park Airport Shuttle service from City Airport Taxis. Book your private airport transfers online, for a reliable transportation service at competitive, all inclusive prices. Searching through these websites can sometimes lead to disappointment though. You'll find many sites offering online booking are merely web forms designed to capture your journey information and submit them to the company and only later will you be called or emailed back with a price.